“It’s good to be home,” said Bishop Hee-Soo Jung. 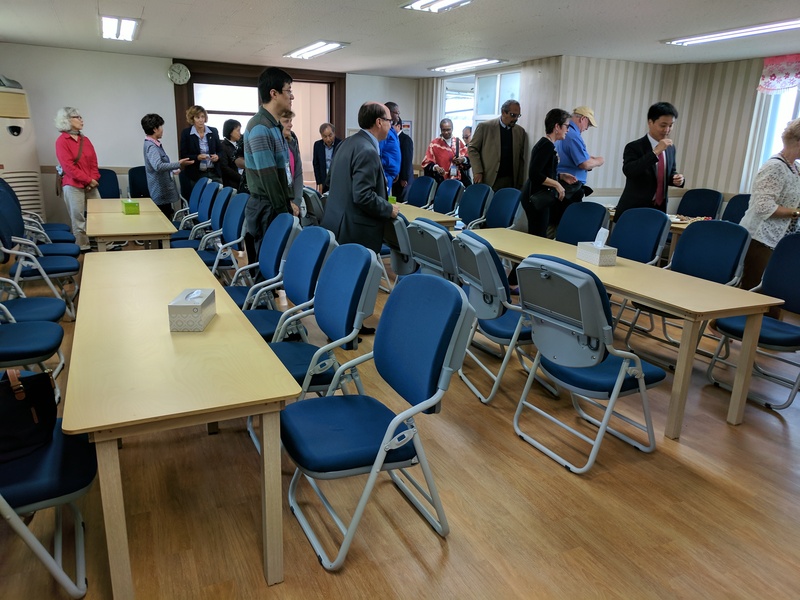 Last Saturday, our group of twenty bishops, clergy, and laity from the North Central Jurisdiction traveled from our home base in Incheon, South Korea, to the island of Ganghwa, along the northwest coast. We had a two-fold purpose. First was to visit the Ganghwa Peace Observatory, which is only 1.4 miles across the water from North Korea. The observatory provides a sacred place for people from around the world to pray for the people of Korea, who have been separated from each other for more than sixty years. 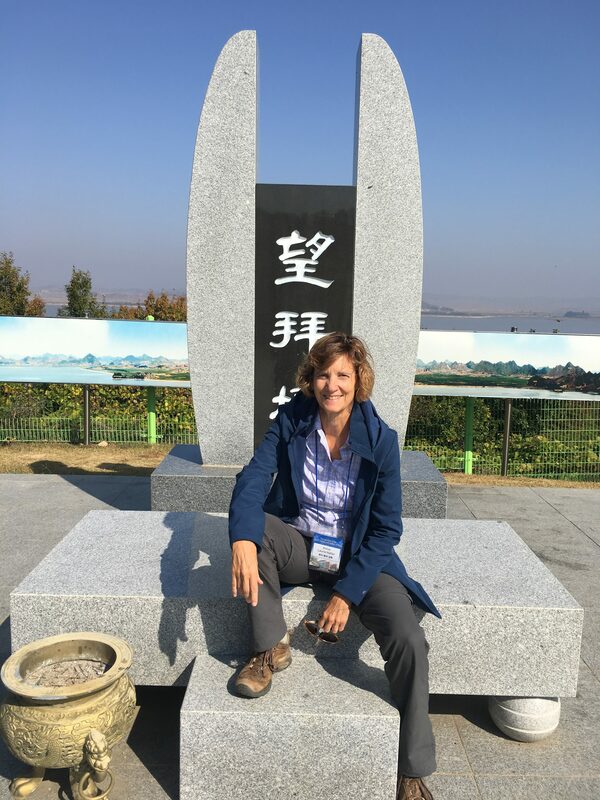 At this time in history, visiting the Peace Observatory also reminds us that tensions between North Korea and the United States are very high right now and that God calls people of faith to advocate for a peaceful reunification of both countries as well as to limit continued nuclear development in North Korea. The Ganghwa Peace Observatory was a deeply meaningful experience, as we stood in front of the “altar to bowing for lost people” and prayed that God would use each one of us as instruments of God’s peace. The conflicts that we experience at times in the church as well as in our everyday lives seem trivial in comparison to families that were torn apart in an instant and are still not reunited. 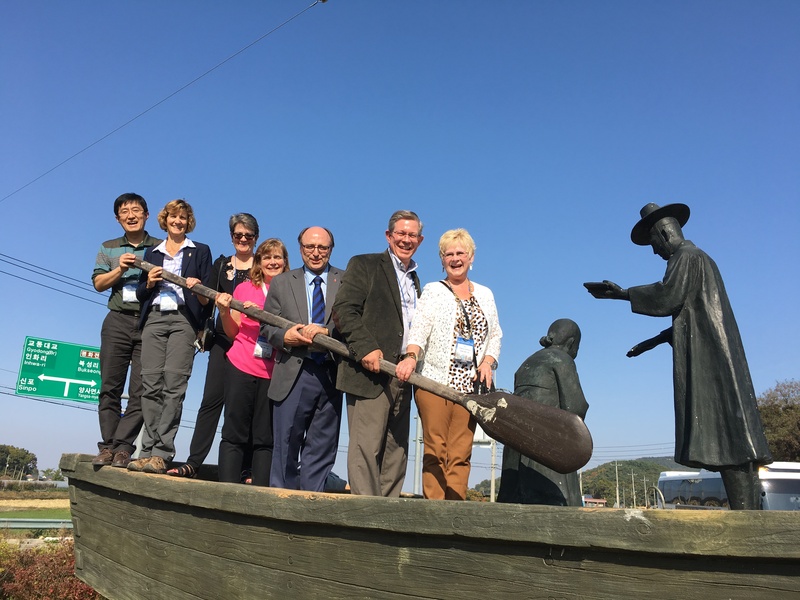 The second reason we visited Ganghwa Island is because of its Methodist connections. The leader of our spiritual and cultural pilgrimage to Korea, Bishop Hee-Soo Jung of Wisconsin, was born and lived his early life on the island. It so happens that the house in which Bishop Jung was raised is now the location of the fellowship hall/educational building of the church in which he was baptized at the age of sixteen. As we parked the bus and walked a quarter of a mile to Shinsam Methodist Church, Bishop Jung talked about his growing up years in a Buddhist Confucian family. Even though his parents were not Christians, he made a conscious decision to give his life to Christ as a teenager because of the influence of the Methodist preacher who built a church next to their house. We were greeted warmly by the pastor of Shinsam Methodist Church and his wife, as well as Bishop Jung’s uncle, who is a congregational leader. We took off our shoes, as is the custom in much of Korea, and were seated in this beautiful sanctuary. Bishop Jung’s uncle told some stories from the church’s past, and then Bishop Jung shared how he came to faith. His parents did not want him to go to a Christian church, yet Bishop Jung persevered, believing that Christ was the only way forward for him. His uncle lovingly called him the “handsome guy” in the family. The second Methodist Church we visited is the third oldest Methodist church in Korea. In 1892, Missionary George H. Jones tried to go on a mission to Ganghwa Island, but the residents refused to receive him, and it resulted in failure. Around that time, Lee Seung-hwa, who was converted and became a missionary in the town of Incheon, went back to Ganghwa Island, his hometown, and led his mother to God. After Lee’s mother asked to be baptized, Missionary Jones returned to the island dressed in Han-bok, which is Korean traditional clothing, However, Sang-im, a Confucian scholar, refused to let any western people into the village. Consequently, Missionary Jones invited Lee Seung-hwa to bring his mother to the ship by boat. By the light of a full moon, Missionary Jones baptized Lee’s mother in the Yellow. This was the first seed of Christianity planted on Ganghwa Island. Our guide at the Kyosan Methodist Church and museum shared this story to remind us that the gospel of Jesus Christ always begins on the margins. Our call is to spread the gospel that we have inherited from our missionary tradition: a gospel that is relevant to the culture where it is shared, and a gospel that invites all to come to the waters, especially the very least of God’s children. The gospel that missionary Jones preached began on Ganghwa Island started in the northwest corner, moved to the center, and spread all over Ganghwa. At a time when there was a rigid social class system, the gospel of Jesus Christ proclaimed that all are one body, and the dividing wall came down. Missionary Jones and Lee, who was the first upper-class man to be converted to Christianity, are forefathers of the Methodist tradition on Ganghwa Island. Today there are an amazing 125 Methodist churches on the island, all because of Lee, a man who heard the gospel from a western missionary, dedicated his life to Christ and made a commitment to share that love, hope, and peace throughout the island. Social justice, equality of class, and liberation have always been part of the Methodist tradition in Korea. In, 1876 there was one Christian in Korea. In 1906, there were 44,000 Christians. Today, out of a population of 51.1 million people in South Korea, 13.2 million are Protestants. The three largest Protestant groups are Presbyterians, with 36,328 churches and 8,173,488 members; Methodists, with 6,518 churches and 1,486,215 members; and the Assembly of God, with 618 churches, and 1,057,783 churches. 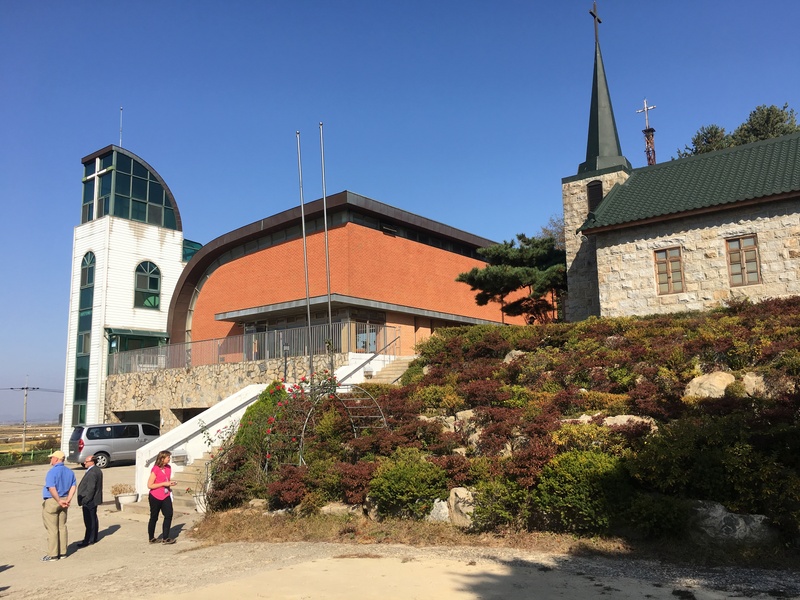 The Korean Methodist Church, which is an autonomous church and not part of The United Methodist Church, has 13 annual conferences, 13 bishops, 3 theological seminaries, 693 facilities for social welfare, and 1,094 missionaries in 72 countries. Thanks be to God for that gifts that the Korean Methodist Church offers to the world: prayer, discipleship, service, deep spiritualty, perseverance, and radical hospitality. Our challenge as Christ followers is to go and do likewise: to offer Christ in such compelling and grace-filled ways that all are invited to come home to the heart of God. So glad to see the picture of the group and to read the stories you shared! Travel back in the safety of God’s love!! Looking forward to seeing you at one of my favorite places in November. Amazing stories of how the church of Jesus Christ was formed in South/Korea as in many overseas countries. The seeds planted have formed strong. sturdy and faithful leaders who risked it all. What a beautiful pilgrimage! I made the Academy for Spiritual Firmation – #18! 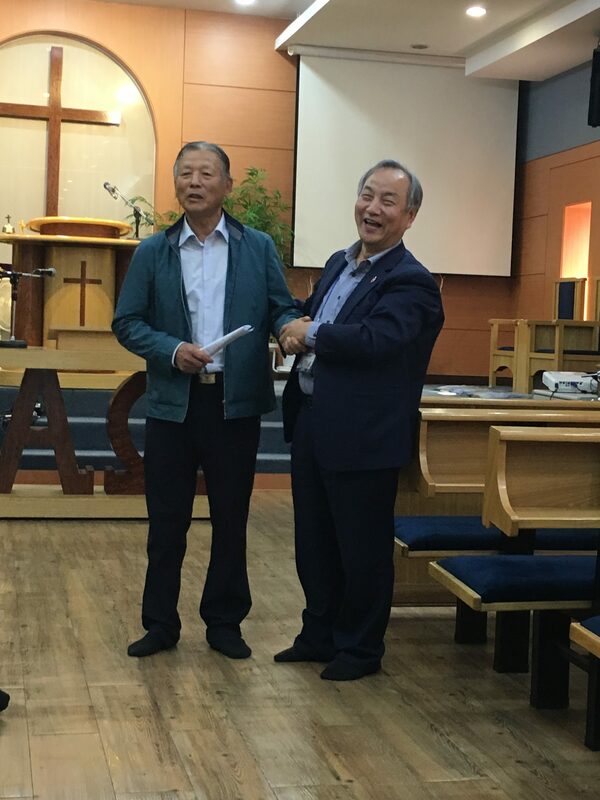 It was a joy and deep blessing for me to be in a small covenant group with Bishop Hee-Soo! The sharing he did during that time and the listening he did-made a huge mark on my life! His deep and very incarnate faith is filled with grace! ‘Kamsa hamnida’ for the stories from the Republic of Korea. So good that you were able to be there and examine the history of Methodism in particular and Christianity in general. What a testimony to perseverance in the missions. Again, many thanks for sharing. What a beautiful experience, thank you so much for sharing…I so enjoy following your travels…To hear the amazing stories of how the church was formed and to see the pictures ….thank you Laurie: May God always keep you safe in your travels. and thank you so much for the wonderful education you give us in your travels.